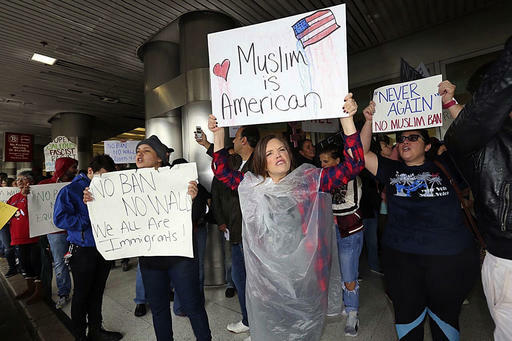 (CN) – The American Civil Liberties Union filed 13 lawsuits in as many jurisdictions seeking information about how President Donald Trump’s first travel ban was implemented by the U.S. Customs and Border Protection. The Freedom of Information Act lawsuits were filed Wednesday in different federal courts because the civil rights organization is looking for information specific to each Customers and Border Protection field office, according to ACLU Attorney Mitra Ebadolahi. Trump signed Executive Order 13769 on Jan. 27, nearly a week after being sworn in as the president. The order sought to bar citizens from six Muslim-majority nations from entering the United States for a 90-day period, while keeping out Syrian residents indefinitely. The travel ban created immediate chaos at the nation’s airports as immigration officers quickly enforced the new order, requiring some green-card holders and other permanent residents of the United States to fly to different countries and prompting widespread protests at several of international airports. Ebadolahi, who works at the ACLU’s Southern California chapter, said the lawsuits filed in California’s Central and Southern District seek to understand how Customs and Border Protection sought to implement the ban at three airports – McCarran International Airport in Las Vegas, Los Angeles International Airport and San Diego International Airport. The ACLU filed FOIA requests at the 13 different field offices throughout the nation on Feb. 2. Specific to the Los Angeles field office, the ACLU sought to find out more about the rationale behind the detaining of a legal permanent resident from Iran who was traveling with her infant son, a U.S. citizen. At the Detroit Metropolitan Airport, a host of local attorneys arrived on Jan. 27, as reports of green-card holders being subjected to invasive searches of their persons, property and electronic devices spread, according to a complaint filed in Michigan. Vera Eidelman, an attorney with ACLU’s national office in New York, said the FOIA lawsuits are not a merits case that challenges the constitutionality of the travel ban like the one filed in Washington state, where a federal judge granted a temporary restraining order. Customs and Border Protection routinely evades FOIA requests, issuing inappropriate denials, non-responses or causing extensive delays, Ebadolahi said. Trump has since rescinded the Jan. 27 order and replaced it with a new one, signed on March 16. The new order also prompted legal challenges, and a federal judge in Hawaii temporarily blocked it the day before it was supposed to take effect. The Trump administration has appealed, and a Ninth Circuit panel is expected to hear the case in early May. No hearings are currently scheduled for any of the 13 FOIA cases filed by the ACLU. Lawsuits filed in federal court seek information for the following Customs and Border Protection field offices: Atlanta, Boston Baltimore, Chicago, Detroit, Houston, Los Angeles, Miami, Portland, San Diego, San Francisco, Seattle, Tampa and Tucson.